This Dragon car seat cover set has cool breathing polyester/cotton; the back part is polyester, and foam lining. The Dragon sign is in the embroidery. Tribal seat covers in hard wearing, machine washable padded cotton/polyester. Complete set of seat covers to fit most cars. 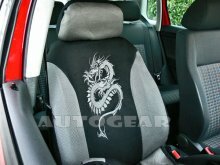 Embroidered grey Dragon logo seat covers Product Features: • 100% polyester fabric • Foam back for comfort • 2 x front seat covers • 1 x rear seat back cover • 1 x rear seat bottom cover • 2 x head rests covers for front • Universal fit also comes in blue and red.